A Myanmar court on Wednesday rejected a motion to drop a case against two Reuters journalists arrested while investigating a massacre of Rohingya, even as seven soldiers were given lengthy sentences for their role in the killings. Myanmar’s GDP growth rate jumped from 5.9 to 6.8 percent last year on the back of a strong agriculture sector, export growth and robust private consumption, the Asian Development Bank (ADB) said in its Asian Development Outlook 2018. The Myanmar government has said it will repatriate only the Rohingya refugees from Bangladesh whose right to residency in Myanmar is proven in the ongoing verification process. State-owned Myanma Petrochemical Enterprise (MPE) is planning to build a new oil refinery near an existing state-run facility in Magwe Region, Daw Yin Yin Aung, deputy director of MPE, told The Myanmar Times. Wa Lone and Kyaw Soe Oo, two detained Reuters journalists, returned to a Yangon courtroom on March 28 for the latest hearing in their trial for handling “secret documents” related to security operations in Myanmar’s northern Rakhine State. 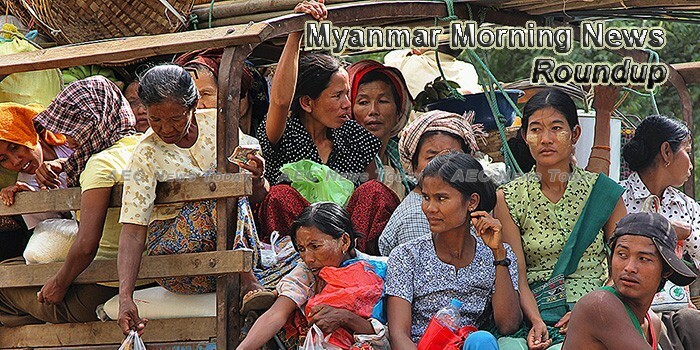 Local and foreign investments allowed by Myanmar Investment Commission (MIC) in 2017-18 FY will create over 110,000 job opportunities, according to Directorate of Investment and Companies Administration (DICA). When Facebook CEO Mark Zuckerberg took to Capitol Hill this week, he was bound to face a variety of difficult questions ranging from his company’s handling of user information to the proliferation of fake news over its pages. Thabyay Education Foundation will next month launch an institute to train the next generation of leaders to take part in the peace process. A senior Myanmar official says the quick repatriation of Rohingya Muslims, who fled in their hundreds of thousands to neighbouring Bangladesh after last year’s brutal military crackdown, is a priority for his government. Rakhine State Minister for Social Welfare Dr. Chan Tar, who is also chairman of the Rakhine State Maha Thingyan Festival Executive Committee, told reporters that Rakhine State will hold a traditional Thingyan Festival amid other festivals that will celebrate the Myanmar New Year of 1380. THE FORESTED hills of Tanintharyi Region seem to roll on forever; except where they have been cleared for villages and palm oil, or for rubber and areca nut plantations, all which appear on the horizon in different shades of green. She woke up in a shack of ragged tarpaulin on a dusty hillside in Bangladesh. Her husband, Nur Mohammed, is never coming home. He was one of 10 Rohingya Muslim men massacred last September by Myanmar soldiers and Rakhine Buddhists at the coastal village of Inn Din. Japanese firms have invested most in productivity sector in Thilawa Special Economic Zone and the number has reached over 45, according to the zone management committee. Yoma Bank and Maha Agriculture Public Co. Ltd. jointly announced the completion of a MMK 3.5 billion (USD 2.6 million) funding agreement on April 2nd, 2018 in support of Maha Agriculture Microfinance’s lending activities in Myanmar.